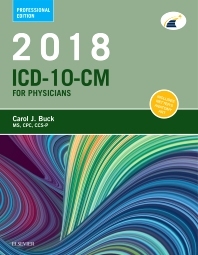 Select diagnosis codes accurately with Carol J. Buck's 2018 ICD-10-CM for Physicians: Professional Edition. Designed by coders for coders, this practical manual includes all the ICD-10 codes needed for basic outpatient and physician office coding. As coders need more extensive knowledge to code with ICD-10-CM — and to choose from the thousands of possible codes — this edition provides an essential background in A&P, pathology, and medical terminology, along with colorful Netter’s Anatomy illustrations and clear instructions for using the book. Together, these features make diagnosis coding faster and easier. Also included is a companion website with the latest coding news and updates! 175 illustrations provide visual orientation and enhance understanding of specific coding situations. Placeholder X symbol reminds users to assign placeholder X for codes less than 6 characters that require a 7th character.